Lora: We are the Offer family. Brian and I have been married for 26 years, and have seven children, ages four to almost twenty four. All but one of our children are adopted. One of our son’s was adopted domestically at birth, and the other five internationally from Taiwan and China. In October of 2015, when we were in the process of bringing home two of our children from China, I had the opportunity to join the Superkids team in China. It was an amazing two week journey to several different orphanages in different parts of China, one that changed my life forever. It was so wonderful to meet so many beautiful children, and so hard to leave them knowing that so many of them would never get the chance to have a forever family. Michelle: Hello we are the Snyders. Team Snyder currently consists of five members. Baba, aka Lonnie. Mama, aka Michelle (that’s me). Big sister (21), Kaiyla. Big brother (19), Kyle. And our newest addition is little brother (3), Miles. There are also two fur pup siblings, Lorna a shepadoodle and Sam a bichon frise. Lonnie and I have been married for 11 years. When we met I brought along with me the two little loves of my life, Kaiyla and Kyle. Just a short 9 months ago we brought home our newest family member, Miles. An adoption journey that lead us half way around the world and has forever rocked our worlds. Through this journey I have come to be an active advocate for the waiting littles of Taiwan and have even had the opportunity to join the Superkids team on the Taiwan trips. Our adoption journey led us to become a part of the Gladney family. It all began with a little post on the Superkids blog about precious little… Magnificent Miles! GC: How did you come to the decision to adopt a child? L: Our first adoption took place when we were still younger parents, and had gone through years of secondary infertility after having our biological daughter. Once our son came home through a domestic infant adoption, we had our standard two children, my husband was hitting forty, and he was “done!” Ten years later we began meeting other families who had larger families, and were “older” parents, and realized that we weren’t ready to be done, and that we wanted to share what we had as a family with another son or daughter. 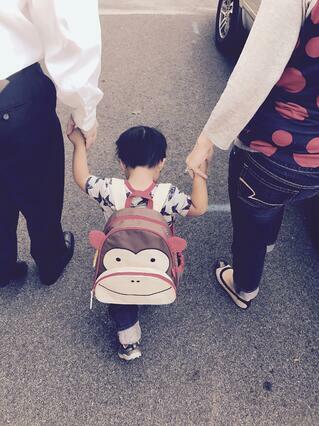 Our sweet son from Taiwan came home at 22 months, and would later be diagnosed with Autism. As challenging as this was (and is) at times, it made us realize what we were capable of handling as parents, and that parenting a child with special needs wasn’t as scary as we had previously thought. 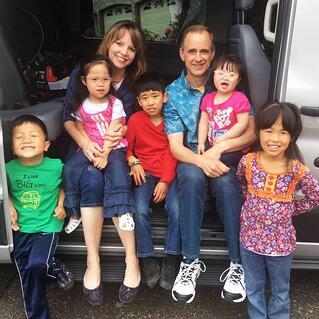 It opened our hearts up to adopting two more children later who were diagnosed with special needs from China, and then later our two girls with Down syndrome from China. M: A short 2 years ago one Rainbow kids email changed our lives forever. A little face and a short Superkids blog post… and we knew Magnificent Miles was our son! Adoption has always been a part of my life plan. So when my hubby came on board I was totally excited. Soon it became our family plan to grow our family… did that mean adoption by foster, domestic, international… that was all to be determined. We were not exactly sure of a lot of things but one thing we did know is that we wanted to be the family to a little that just might get overlooked. All this in mind we had no idea what God had in store. Boy oh boy oh boy… within weeks of our decision we saw our little’s blog post! And we knew instantly he was our son! So off and running… agency - check, home study - check, match request - check… They really are not kidding when they say paper pregnant! Adoption means a lot of paperwork. A lot of letting people into every corner, under the rug and even in your messy closet… Nothing left unturned. GC: When did you realize that you were interested in/ready to adopt a child with Down syndrome? Because that is where my son was and how he was created to be uniquely him. Magnificent Miles was meant to be a Snyder. We knew from the first moments we laid eyes on him. If you had asked me 10 years ago if I would be a mama to a little boy rocking his extra chromosome that was born half way around the world, I would have told you that you were out of your mind! And today I cannot even begin to imagine life without him. L: Our two children from China hadn’t been home very long before I decided to start peeking at the advocacy sites and different agencies’ ‘Waiting Children’ web pages. There had been a six year old boy with Cerebral Palsy that I absolutely fell in love with while on our Superkids trip the year before. I continued thinking about him for months, and hoped that we would possibly be able to bring him home one day, but the timing just wasn’t right, as he didn’t yet have a file prepared in China, and we were unsure of when he would. Still having that longing to bring another child home, I began my search through the internet. As I searched the currently available children on one particular agency’s page, I got to a group of children’s posts who had Down syndrome, and quickly scrolled past thinking, “Oh, we can’t adopt a child with Down syndrome!” And then a huge light bulb went off in my mind, and I realized that a child with Down syndrome was exactly who we should adopt! 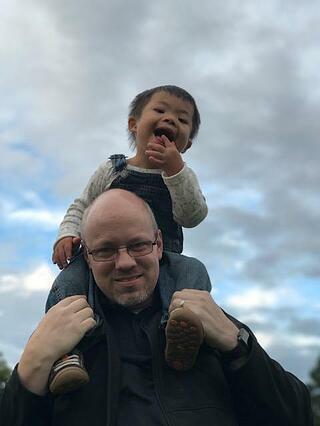 During our previous adoption I had seen a few families from Facebook groups who had brought home a son or daughter with Down syndrome, and at the time thought it was a wonderful thing to do, but that is as far as my thoughts went until that light bulb moment later. That evening I took my husband to dinner and told him, “I think we should adopt again, and not only that, but I think we should adopt a child with Down syndrome.” I think it was because it was such a huge consideration that he even agreed to pray about it, and then within days agreed to go forward to bring a child with Down syndrome into our family. GC: What was it like meeting your child(ren) for the first time? Due to some super awesomeness I was actually able to see our little two times before bringing him home. Traveling and being a part of the Superkids team allowed me this great opportunity. Although seeing him for the first time when we went to bring him home holds its own special memory. This time I wouldn’t be boarding the plane in tears as I left a part of me behind… this time my baby boy would be in my arms forever! All the emotions you could possibly imagine going through your mind at the same time. L: We ended up deciding to bring home two daughters with Down syndrome from two different provinces, so while my husband stayed home with our other children, I traveled to different cities to meet them, about a week apart. My feeling on meeting each of them was really awe. They were both so amazing, and I felt somewhat unworthy to be given these treasures from God as my own daughters. They both have such different personalities and abilities, which somehow blend together so beautifully, and they adjusted and bonded with me, and later the rest of the family, very quickly. GC: What was the reaction of your family and community when you brought your child(ren) home? M: Our family was waiting with open arms as we returned home with our little. Each and every member was eager to meet our little guy and introduce themselves. My niece even called Miles “her Miles”… she didn’t want to share him with any of the other cousins. So precious! Our community of friends was welcoming also. We have a network of church and other communities such as the DSANV (Down syndrome Association of Northern Virginia) that have come along side us during this journey. We are truly blessed. GC: What was the hardest thing about transitioning your child(ren) into your family? M: Honestly, Miles has transitioned into the family so smoothly that we don’t really have any transition complications to share. We often say that it seems like he has been a Snyder all his life. L: Honestly, the girls transitioned very easily into our family. I would say easier than any of our previous international adoptions. They truly fit right in. We were not new to parenting, or special needs, and really, our day to day life with our girls with Down syndrome is no different than raising our other children. GC: How did your other kids react to their new sibling? L: Our girls are pretty much adored by all of their siblings, from our adult children on down. Even our ten year old, who has Autism, and is pretty intolerant of any perceived indiscretions from his other siblings, is very forbearing with his little sisters. I think because he knows that there is no guile in them, he knows that there is no intent on their part to offend him. He will often say, “Mom, I just love the girls!”, and he loves to kiss them on the head! M: Big sister and big brother are completely in love with their little brother! They both have a precious priceless bond with him. Watching them interact melts this mama heart. GC: What was the most helpful thing to you as you prepared to adopt a child with Down syndrome? L: I did try to learn more about Down syndrome in general while waiting for our girls to come home, but really the most helpful thing for me was just to read the experiences of other families who had adopted a child with Down syndrome through their blogs and articles. I got to know other mamas who had adopted children with Down syndrome online, and poured over their posts and photos. I also joined the Down Syndrome Adoption Facebook page and asked questions of the many experienced families in the group. M: Most helpful? A lot of reading, connecting with other adoptive parents (with & without special needs), and connecting with other parents to a child with Down syndrome. Asking questions about their experience. GC: What is your favorite thing about your child(ren)? M: My favorite thing about Miles… hum… that he is exactly who he is meant to be. Rocking that extra chromosome. I love his sweet compassionate personality, his contagious smile, and ooh his precious giggle and absolutely adorable toes! He loves books and cuddle time! A new adventure that awaits each and every day… he truly amazes me. The sheer joy of having the privilege to be Miles forever mama is worth a million words. To come alongside him as he journeys through life, to advocate for him when others may questions his abilities, to love him unconditionally for exactly who he is, is a privilege. L: I love how my girls have a fresh look at life. Their expressions, their responses are so genuine and uninhibited. Their unbridled joy tends to rub off on whomever they are around. I can be having a very dark day with the weight of the world on my shoulders, or another one of my children that is pushing the boundaries of my patience, but then one of the girls will come in and joyfully throw her arms around me, or do or say something adorable or hilarious, and I can’t help but smile and feel the weight lifted. Not that they don’t have their own moments, because they can be stubborn and have good and bad days like everybody else. Truly, though, they are little rays of sunshine in our home. GC: What would you say the greatest challenge is about parenting your child(ren) with Down syndrome? L: I think my greatest challenge in parenting my girls with Down syndrome has not so much to do with their Down syndrome as the fact that I have a bigger family now at an older age, and my older children, who at one time would have been able to help out, are now grown and gone. I would actually say that of the five younger children that we now have at home, our girls with DS are the easiest by far. Interestingly, our 4 year old daughter with DS is much higher functioning than our 6 year old with DS. Developmentally, our 6 year old is probably more like a 2-3 year old. I don’t feel that she is particularly challenging because of this (in fact she is extremely easy going! ), but it is a good thing to be prepared for when waiting for a child with Down syndrome to come home. They are each so unique, and their needs and abilities can vary so much. M: The greatest challenge would have to be learning how to advocate for Miles in the most positive way possible. This mama bear wants to protect her cub but to also educate others. 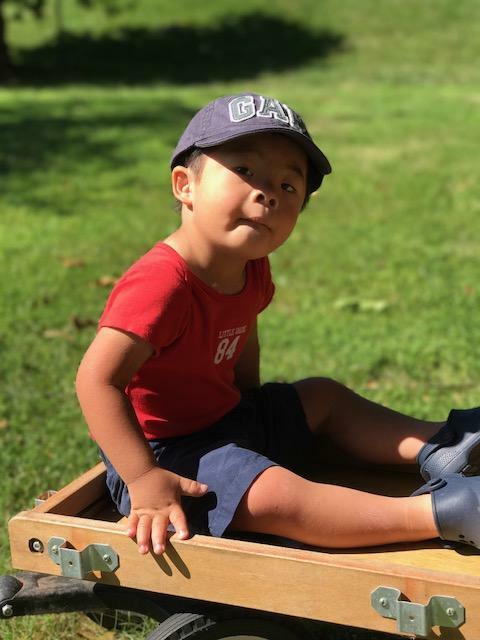 GC: What advice would you give to other parents considering adopting a child with Down syndrome? M: The greatest guidance I have to offer any family considering adopting would be… make sure the whole family is on the same page, because this is a big decision. Talk to them about what life looks like bringing home a child but also talk about what life will look like in the future. The short-term future which consists of bonding, doctor check ups and the initial family dynamic change as well as the long-term future thoughts to consider such as what happens when the child is now an adult and may still need assistance with care, etc. Keeping all members of the family in the loop as the process of adoption happens and asking questions is important since each member will process this in a different way. Educate together and ask questions together. Unity is key. As with anything there are no absolutes. Having the information will assist your family in working through anything that may come up, no matter if it is Down syndrome related or adoption related. But above all… don’t let the diagnosis of Down syndrome discourage you. Down syndrome does not define your future little. Just like blonde hair and blue eyes may be a part of the identity of a child, so is the extra chromosome of those with Down syndrome. The littles that rock their extra chromosome are just like any other little. They too need a mama to hold them and whisper “I love you, you are precious.” There may be a few more small hills to climb but nonetheless totally worth the journey. Each child with Down syndrome is different, as some may have little to no medical needs while others may have heart matters, thyroid matters and muscle tone matters. We all have our “matters” so honestly it comes down to what “matters” you are comfortable with navigating. L: My advice would be to become educated about Down syndrome, read other families’ stories, get to know families that have children with Down syndrome. Most of all I would say that to bring home a child with Down syndrome, you need to be open and accepting to all possibilities. As with any international adoption, you learn as much as you can about your child before they come home, but there is always the possibility that there may be more (or sometimes less!) medically or emotionally than you had planned for. Again, every child with Down syndrome is different. Don’t have expectations as to where your child will be developmentally when they come home. Just meet them where they are at.